We “The Children of The Most High”. like to invite You to an enlighted revelation of “The Most Highest Cosmic Consciousness” to the people of this strife-torn world; whether it be in Real Life or in Second Life. The show is a mixture of highly spiritual music and cosmic speech blended with universal insight, wisdom and philosophy. Only the best scripters available in Second Life have been used to create the ultimate firetools and a fantastic assortment of lighting effects, the pyramids and trapezes. But really, the best thing to do is to come and see for yourself and experience the magic! It is our wish and desire that Light, Life and Love may prevail and sustain within you on your journey through the labyrinth of knowledge, understanding and wisdom, as you progress forward into immortality, and on into eternity for eventually one day to be a child of The universe in Love with it all and The One. We ask You to give from your heart, your mind, your personality, your soul and spirit…cause please consider and remember….. If your children and their grandchildren is going to live here and be the new caretakers, torchbearers and trailblazers of the future of planet earth, we the parents, the old ones must pave the way for the Light, life and Love which surely will come after us. Together with Cylindrians live music, the ChangHigh Sisters will not only dance their beautiful firedances of an exotic and seductive nature, but will in the show, present the virtuals worlds first 2, 3, 6 and 7 acrobatic pyramids and will jump up in their rotating trapezes and show the harmony and elegance of an almost unseen kind ever before. 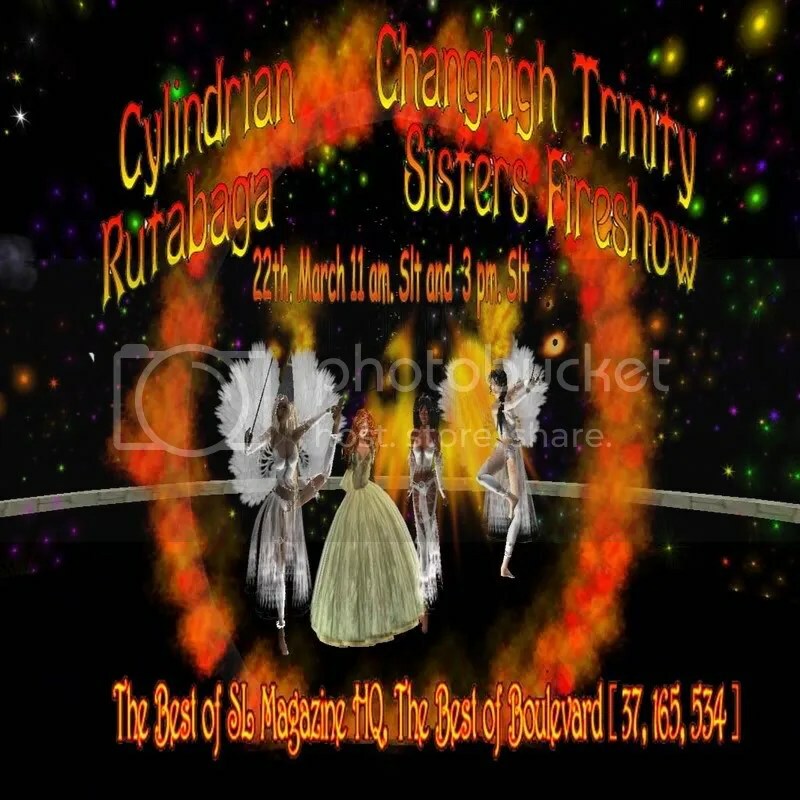 Come and see them while they are on fire, alive and in action they are the most unusual performing troup today in SL . Sincerely Yman Juran………… on behalf of my sisters and together we are The ChangHIGH Trinity Sisters of Light, Life and Love.